(1) The following General Terms and Conditions apply to all deliveries between us and a consumer in the version valid at the time of presentation. A consumer is any natural person who concludes a legal transaction for purposes which can predominantly neither be attributed to his commercial nor his self-employed professional activity (§ 13 BGB). (3) The presentation of the goods in our online shop does not represent a legally binding contractual offer on our part, but is only a non-binding invitation to the consumer to order goods. With the order of the desired commodity the consumer delivers a binding offer for him on conclusion of a sales contract. (4) Upon receipt of an order in our online shop, the following regulations apply: The consumer submits a binding contractual offer by successfully completing the order procedure provided for in our online shop. 4. Hook set at: General terms and conditions were read and accepted. 5. Put a checkmark at: By sending this form you place a binding order. 7. Binding dispatch of the order by clicking on the button "order payable" The consumer can correct possible input errors before the binding dispatch of the order or can cancel the order process by closing the Internet browser. We confirm the receipt of the order directly by an automatically generated e-mail ("order confirmation"). With this we accept your offer. (5) Storage of the contract text with orders over our Onlineshop: We will send you the order confirmation by e-mail. You can also view the General Terms and Conditions at any time at http://www.joes-finest.com/en/gtc.php . For security reasons, your order data is no longer accessible via the Internet. (1) The indicated prices contain the legal value added tax and other price components. In addition there are possible forwarding expenses. 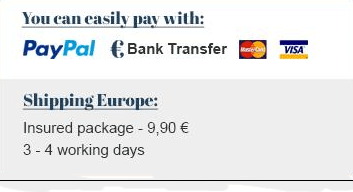 (2) The consumer has the option of payment in advance (bank transfer), PayPal, Creditcard. (1) As a rule, delivery shall take place within 7 working days at the latest. In the case of advance payment, the delivery period shall commence on the day following the payment order to the bank commissioned with the transfer and, in the case of all other payment methods, on the day following the conclusion of the contract. If the deadline falls on a Saturday, Sunday or public holiday at the place of delivery, the deadline shall end on the next working day. (2) The risk of accidental loss and accidental deterioration of the goods sold shall not pass to the Buyer until the goods have been handed over to the Buyer, even in the case of a sale to destination. We reserve the right of ownership of the goods until the purchase price has been paid in full. The revocation period shall be fourteen days from the day on which you or a third party other than the carrier designated by you have taken possession of the goods. Inform you of your decision to revoke this Agreement by means of a clear statement (e.g. a letter or e-mail sent by post). You can use the attached sample revocation form for this purpose, which is, however, not mandatory. If you revoke this Agreement, we will refund to you all payments we have received from you, including delivery charges (other than the additional charges arising from your choosing a method of delivery other than the cheapest standard delivery offered by us), immediately and no later than fourteen days from the date we receive notice of your revocation of this Agreement. For this refund we will use the same means of payment as you used for the original transaction, unless expressly agreed otherwise with you; in no event will you be charged for this refund. We may refuse to refund until we have received the Goods back or until you have proved that you have returned the Goods, whichever is earlier. You must return or hand over the goods to us immediately and in any case within fourteen days of the day on which you notify us of the revocation of this contract at the latest. This period shall be deemed to have been observed if you dispatch the goods before expiry of the period of fourteen days. JOE'S FINEST can be tested by the customer for 60 days. Should the customer not be satisfied, he can return the unopened products to us at his own expense and receive the product price of the unopened products including VAT from us. (without shipping costs) from us back. The following list is only an example and is not complete. The money-back guarantee applies only to end customers in the private sector up to 3 packs per customer. All other packages are excluded from the money-back guarantee. In order to make claims in the event of any problems that may arise (e.g. through dispatch), the customer must store the goods and the complete dispatch packaging without alterations until the matter has been clarified. If the packaging has already been destroyed and an inspection is no longer possible, there is no claim to reimbursement of costs. (This applies both to a new dispatch and the money back guarantee or a revocation) The commodity must be examined with receipt by the customer, since otherwise no Regeressansprüche with the dispatch service provider exist! Furthermore, in the case of damaged (e.g. scratched) products, no claim can be made for the return of the goods. At this point we expressly point out that each body reacts differently and that a variety of factors such as nutrition, stress and genetics play a role in the success of JOE'S FINEST and influence the results. A balanced diet and appropriate stress management are recommended. A guarantee for accelerated beard growth cannot be given. In case of doubt, a doctor should be consulted in order to clarify a future sensible procedure. Your best piece. Natural. Stylish. Masculine.Try 60 days risk-free.